Really, there is no such thing as a healing of the Spirit, as one’s Spirit is pure, unsullied and unsulliable, untarnished and untarnishable; regardless of what one may have done through thought, deed, action and behavior – or experienced via trauma, tragedy and violation – to bring about a corruption of the Soul thereby.Spirit is a singularity of frequency. Each and every person’s frequency is unique, unchanging and enduring, lifetime to lifetime to lifetime.Soul is comprised of life-force. This life-force is generated through the dynamic tension that exists between our instinctually-driven bodies and our culturally-conditioned minds. If the body and mind are in harmony with each other, this life-force generated has a life-positive attribute, experienced as a positive emotion. When the body and mind, that is, our cultural conditionings and our instinctual drives, are in conflict with each other, that dynamic life-force that is generated thereby has a life-negative attribute, that is, it is experienced as a negative emotional state. Spirit resonates through the field of life-force (also known as soul-force) that we have generated throughout our life and lifetimes of experience. Where the soul-force we have engendered is of a positive nature, our Spirit is able to express itself with ease and harmony through our life and into the world. If, however, the soul-force has become contaminated with hostility, fear, anguish or a panoply of other debilitating experiences, the frequency of our Spirit is modulated by that disruption. Our experience of our Spirit’s intent is then muddied. Dysfunctional and debilitating life experiences are the consequence of our Spirit’s resonating through a disrupted soul-force field. When the Soul is dissonant, Spirit’s expression into and as our life experience is dissonant as well. We experience this as hardships and difficulties, misfortune and illness. Whereas cleansing of the emotional body and the auric field is valuable and necessary as a part of one’s inner house cleaning rituals, these do not alter the positive or negative nature of the soul-force that has been stored in the Soul consequential to the events of our life. This is why some find that, despite repeated emotional and energetic healings, the same conditions seem to crop back up continually. A deep understanding we have in our Shamanic Ways is of the underlying principles that govern the functions of life-force. Critical of these is the knowledge that energy is life-force in its dissipative state. No matter how much work is done at an energetic level, this will never affect the state and quality of soul-force, and therefore will not be able to alter the condition of the Soul. A Shamanic Soul Cleansing is, in essence, a cleansing of the contamination residue that is left in the field of soul force – that is, in the Soul – following the conflict and discord, heartache and grief, or trauma and travail in a person’s life. This is brought about the the application of the natural laws that regulate the movement and flow of life-force. 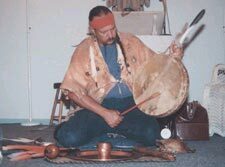 Shamanic methods and techniques are designed to address just such situations. By engaging the techniques of the movement of life-force, Shamanic methods allow one to remove the field of disrupted life-force, separating it from the healthy life-force, purify it and then return it back into the Soul. Once the life-force has been cleansed and re-infused into the Soul it is able to be drawn upon for the regeneration of our health and well-being. Sweet Grass, to make pleasant a residing place for the Spirits that will be called upon for assistance. Palo Santo, (or Copal, depending on which I have handy) an incense from the Amazon that both ‘makes beautiful’ and brings about an empowerment. Grandmother Sage/Spirit Caller (atemisia tridentia, not salvia sage!) to call in the specific Spirits (frequencies) that we require to aid us in creating the harmonic resonance in or Soul that will enable the manifest expression of our heart’s desire. Through the knowledgeable utilization of the assistance of the Spirits of these herbal incenses we, in our Shamanic Ways, are able to set into motion the song of our Spirit’s intent, i.e. : a Blessing! To request this ceremony, send in the Registration, then send $333 via PayPal from the Payment page.